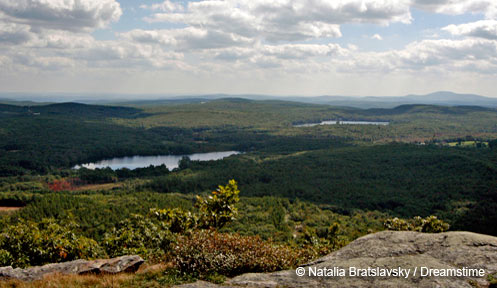 Acquisition History: The Connecticut Lakes Natural Area was established in 2002 as a result of one of the largest land conservation projects since the formation of the White Mountain National Forest. Originally part of a 171,400-acre private ownership, the CLNA (specifically identified for its biodiversity and wildlife habitat values) is owned and managed by the New Hampshire Fish and Game Department (NHFG) under a conservation easement held by The Nature Conservancy (TNC). The CLNA was established using Forest Legacy, Land Conservation and Heritage Investment Program, North American Wetlands Conservation Act and state monies. Description: The CLNA is NHFG's largest ownership, and under the conservation easement it has a special set of management goals and objectives unique to the property. For example, the CLNA has been separated into two complementary management areas. The first is the 14,995-acre Nature Preserve , which is located east of NH Route 3. This portion of the property will undergo natural vegetation succession without active management, allowing the Department to monitor naturally occurring changes on the landscape. The second area is the remaining 10,005-acre Wildlife Management Area , which is actively managed to maintain and enhance a variety of wildlife species and habitats found in the Connecticut Lakes area. The terrain and habitats of the CLNA are very diverse. Elevation ranges from approximately 1,100 feet to a maximum of 3,380 feet throughout the CLNA and includes five mountaintops over 3,000 feet and numerous summits over 2,700 feet. Principal landforms include mountain tops and high slopes, rocky ridges and cliffs, mid-slopes, lower slopes and valley bottoms, riparian zones, wetland basins, and open water. As a result of the diverse terrain, the CLNA contains a wealth of natural communities and wildlife habitats, as well as a large number of rare and imperiled plant and animal species. Common Wildlife: The CLNA lies within a very large, unfragmented and primarily forested landscape that supports a high diversity of wildlife representative of the Northern Forest. Common species include deer, bear, moose, ruffed grouse and snowshoe hare. Nongame species found on the property include the full suite of bird, mammal, reptile and amphibian species common to northern hardwood and boreal forests. Special Notes: The known natural resource attributes of this property are numerous, but there are certainly more out there waiting to be explored and discovered. The rich array of natural communities and diverse wildlife resources on the CLNA provide unprecedented opportunities for landscape-scale conservation, ecosystem restoration, long-term wildlife management, and important long-range natural resource studies. While the timber resource was the principal economic engine of the region historically, the Pittsburg area and its industrial forestland had also become known as a destination for recreation such as hunting and fishing. More recently, snowmobiling has emerged as a major winter recreational pursuit and become a significant and important component of the area's economy. Other recreational pursuits have also grown in popularity on the land base, including bird watching, wildlife viewing, plant study, and canoeing and kayaking. Directions: The CLNA is located in the towns of Pittsburg and Clarksville, New Hampshire. The South Bay Bog Operating Unit is located between Lake Francis and 1st Connecticut Lake, and can be accessed off of River Road and Carr Ridge. The remaining units are located entirely in Pittsburg along the Canadian border. Primary access is off NH Route 3.